Whew! Finally, I managed to finish the next installment of The Tale of Two Mountains. Ordinarily, I wouldn’t post on a weekend, but it’s taken me so long to finish, I think it’s best to get it out of the way now, rather than wait any longer. You have no idea how much tears and bloodshed* have gone into this chapter. Please, be patient with me while I continue to write, and don’t hold it too much against me when what I think will take me two weeks, at most, takes me a month or more because it’s summer. Writing with everyone home is the sort of torturous task I would not wish on my worst enemy, if I had one. Just know I truly want to make sure everything I post is worth reading, especially when it is Eleventh Age lore, which means stealing every silent moment to write and rewrite and read and write again, as long as it takes to get the job done. I am sorry this has taken so long, but I hope you enjoy part 11 of The Tale of Two Mountains. *Bloodshed may be a bit of an exaggeration. The tunnel was silent— too silent, Noel thought, pulling on his pack as he stared into the depths, unable to see more than a few feet into the frigid darkness. He had slept through the day and into the evening, and thanks to the Iachaol, there was no sign left he had ever been wounded, let alone nearly died attempting to reach this place, but while he felt stronger now, and was prepared to face whatever he must, in order to find the answers his people needed, he could not help the apprehension currently making knots of his innards, warning him not to venture into the unfathomable black before him. He knew he was not welcome there, his rescuers had made that clear, but at the moment, humans were the least of his worries. There were very few things he would admit as irrational fears— tight spaces… bees— but the dark was not among them. This darkness, though… It was unnatural, unlike any magic he had ever seen. “I’m beginning to believe Phileas knew about you all along and just wasn’t up for your brand of dark and dreary,” he laughed, shaking off the thought as he rested a hand on the cave wall, finding the stone smooth under his fingers, worn clean by ages of erosion. He imagined this was once the source of the ancient river that carved its winding path through the mountains, its falls now forming the glaciers that concealed this place, frozen soldiers standing watch over their keep, serving as reminders of the centuries of change the world had witnessed since the life-spring spilled freely from the mount. It is told that in the Fall, the lands rose up like waves, swallowing cities, whole peoples were swept to their deaths as the seas washed over the earth, fires raged for many moons turning night to daybreak and day to dusk, and in the end, the world was an altogether different place, with very little left for the few survivors to rebuild. If these people had managed to survive the Fall untouched, it stood to reason they possessed abilities the rest of the world had long forgotten. Perhaps that explained the uncanny gloom. Noel knelt down and picked up the branch of Hestia’s flame he had taken from the fire, to use as a torch, and waved it inside, but despite the power of the goddess’s charm, the light made little difference. “We could put the past behind us, you and I, and be friends? What say I’ll tread lightly on you, and you do your best not to kill me again?” he laughed low, taking his first step into the unknown, stopping just inside the entrance, half-expecting some invisible force to compel him to leave, but nothing came to greet him. There was nothing there but endless, formidable silence, stretching off into an indefatigable blackness, that even Hestia’s eternal light could hardly penetrate. It cast only an eerie indigo glow around him, extending up the cavern wall nearest to him, causing stripes of sediments to glisten, but quickly falling off against the long, livid bleakness that rested so heavy in the air even Noel’s own shadow was lost in its obscurity. “A fine start,” he whispered, swallowing back the lump that tightened in his throat. Squinting into the grim, he remained close to the wall for guidance, searching for any evidence of human use as he went along. There were no carvings on the pillars whittled out of the earth by the waters that once flowed there, no paintings on the polished stone walls to indicate this place had ever been a home to anyone, nor soot from cooking fires blackening stalactites that occasionally crept into view, encrusted with the scale of some long-dead bacteria, calcified by centuries of brutal chill. The lack of any sign of a clear trail left by the man and woman who saved him was disheartening, but he was certain they were there, somewhere in that mountain, and he would find them, even if he had to search every inch of that dark. The Dreaming had led him there. Though he did not understand just what the Wangarr was, or how it had given him a knowledge so distinct about the location of the seers of old, he could not deny that he knew he was in the right place or pretend he was not still being guided to them somehow. This idea provided a bit of comfort in the face of the appalling nothingness that lingered just at the edges of his dim, eternal light. It was not long before a second wall of stone grew up from the darkness to his left, and after a short journey down the corridor, Noel found himself standing at the center of a vaulted room where pebbles and boulders, rolled smooth millenniums ago, lay still in a fine bed of dust. The water had pooled here once, he thought, swirling around on itself, etching the round walls with deep horizontal grooves as bits of the mountain were picked up in the currents and churned about until they became nothing more than silt. 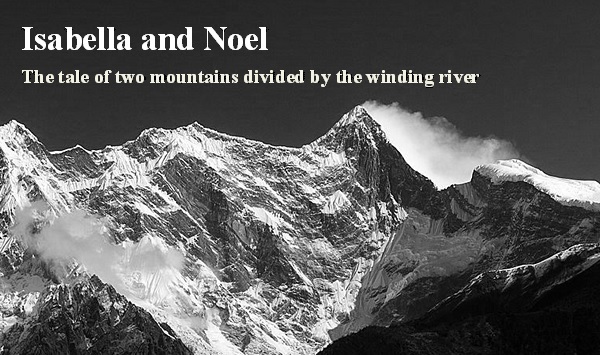 There were two tributaries from which the water once flowed, both of them well over Noel’s head, with boulders piled beneath them like stair-steps, the right one much lower than the left. Noel looked around hoping to find footprints left by his rescuers, but he quickly realized even he left no trace in the powdery remains at his feet. The sand was enchanted, he suspected, waving the flame along the ground and the walls, hoping to find even the smallest indication of which path he should take, but there was none, so he climbed up the boulders to examine the lower channel. The opening, just large enough for a grown man to climb through with a little effort, led to a smaller chamber, but he did not venture inside because the path beyond dropped steeply, before making a sharp turn into the unknown. He jumped down from the rocks and clamored up to the second, larger spillway, sticking his head and the fire inside. It opened into another wide cavern, full of consuming darkness, much like the one he had gratefully left behind. There were no signs to indicate which way to go. “Well, Noel, if you were a lost civilization of seers, which way would you go?” he said, rubbing his hand anxiously over the back of his head. “Would you go,” a voice not quite his own echoed behind him, causing Noel to jump. Noel climbed down into the cavern to investigate, following the wall a short way until he came to a crevice a bit taller than himself, but not much wider. “Hello,” he spoke into the hole. “Hello-o-o,” he heard his voice, not far off, echoing in the round chamber behind him. This had to be where the two paths met, he thought, inching his way inside, his pulse throbbing in his throat with warning as he squeezed himself between the rocks, holding his breath, all the while envisioning the mountain snapping closed around him. But he only had to go a short way before the break in the stones opened into a well-worn chute, that twisted around on itself, and as he came around the bend, he saw that the floor began to slope upward, toward an exit, just big enough for a man. Crawling out, he found himself overlooking the round room once again, just as he suspected. “Well, my friend, if the whole of you is riddled with tunnels full of echoes like these, a fellow could easily find himself lost,” he said to the mountain, tossing his fire onto the ground below. But as he pulled his pack off his shoulder, intending to find a bit of ocher he had picked up in Arnhem Land, to mark the paths he already explored, the little light the flame offered against the overbearing darkness flickered, and Noel looked back in time to see a fine cloud of powdery silt curling itself around the gold and blue flashes, a moment before snuffing it out completely, leaving him blind. Swearing, Noel jumped down from the ledge, running his hands over the sands for his torch, hoping to quickly rekindle the flame, but as he searched the ground, the earth trembled under his feet and the grains began to slip beneath him. An earthquake, Noel thought first, knowing these mountains were prone to them. He was sure the larger tributary was right in front of him, only a short climb away, so he hurried toward it, expecting to quickly make it to safety, but with each step his feet sunk into the flowing sands, and soon he fell forward, the shifting ground pulling him down as he struggled against it. In seconds, he sunk up to his knees, and when he attempted to fly free, the particles rushed up over his thighs, holding him down. He tried to break loose, fighting against slow moving waves of dust, racing against this curious rising current, but every step he took, the grains forced him deeper still, until he was buried up to his hips and could no longer pull his feet above the swells, and he was pushed along helplessly with the creeping torrent of ancient mica and quartz, unable to see any means of escape. He reached out his hands, flinging himself to his sides, hoping to feel some solid earth to grab hold, so he could pull his legs free, but all he felt was the tide of debris, whispering a venomous hiss against him, threatening to bury him alive as he struggled to keep his chest above the flow. If he did not escape soon, he knew it was only a matter of time before he would suffocate under the weight of the sediment, which did not sound like a pleasant way to die. “To die again,” he reminded himself, gritting his teeth, considering his options. “Lost,” the darkness repeated, filling the room. This was clearly no echo. Someone was out there, Noel thought. They were watching, waiting for him to succumb to the rising silt, washing over him like water. “So you like to play with magic?” he said, smiling into the pitch black, an eager calm warming his belly. He had been waiting for a decent fight for decades, to put to use so many years spent in training. Of course, he had always expected to be able to see his foes. If they preferred to play in the dark, perhaps the first thing he should do was shed some real light on the matter. In a blinding flash, an electric current surged from his fingers, crackling through the air in wide branches that crawled furiously across the ceiling, giving Noel just long enough to glance around the room for his attacker. He had expected to find someone standing up in one of the tributaries, and that the light would confuse them just long enough that he could form some attack of his own, perhaps using their own ploys against them. He had not expected to see the young woman who had helped to rescue him, struggling to keep herself from drowning in the sand not very far from him. Though he could think of a dozen ways to get himself out of the pit, he knew he could not risk doing anything that might cause her harm. He had no choice now but to try to reach the woman, even if that meant going under himself. All he could hear now was the rushing of the sand as it grew ever deeper, creeping up his neck, falling past his ears as he tilted his head back to breathe. She had gone under, and he was wasting time. He reached out his hands, stretching as far as he could in the direction of the woman’s cries, pulling against the sand, forcing it away from her, pushing it behind him with ease. He reached out again and felt the tips of her fingers and then her hand, grasping, clutching at his in panic. She was going to die, he thought, grabbing hold of her wrist. He could feel the bones in her wrist separating as he pulled her body toward him with all of his strength. As the earth sunk beneath them, dragging them both downward, the woman wrapped terrified arms around Noel’s neck, still kicking and fighting the sand, her movements strangely slow, suspended there in that deathtrap, stunted by the weight of the sediment around them, forcing them further under. Noel held the woman tight around the chest, so tight she would not be able to take a breath, though her body was already struggling to do so, and clinging to her, he braced himself, then did the only thing he could think to do in that moment, not knowing if it could possibly work or if he was wasting what precious little time he had left to come up with a better plan on something so foolish it could get them both killed. As the woman’s body had stopped convulsing against him, Noel forced his own energy outward in an explosive burst, blasting all the sand into the air, even as he flew through it and slammed headlong into the nearby wall. Falling backwards against the ground, the woman’s lifeless body landed sprawled across him as billions of grains of sand rained down in an angry rush around them. “Up! Get up!” he yelled, lifting her body over his shoulder as he got to his feet. He had to get her to safety, he thought as he followed the wall around in blindness until he felt it turn out into the short tunnel through which he had first come to the round chamber. But as he made to lay her body down on the ground to try and get her to breathe again, spitting dirt, wiping the sands from his eyes, he blinked, and in a flash of indigo light, he saw that the terrible thing he held in his arms was not a young woman covered in dirt, in need of saving, but a rotting corpse, mummified skin stretched taut over brittle bones, strands of her long dark hair twisted in his fingers, onyx eyes staring up at him, reflecting his terror, as the sand poured from her orifices, piling up around them, before darkness fell again. Shoving the carcass away, Noel clamored to his feet, stumbling backwards into the wall behind him, mortified, prepared to run, just trying to settle on which direction he should go given what had happened— further into the depths of this strange hell where he found himself, or away, as far away as he could go and never look back. But as he opened his eyes once more, running dirt-parched hands over his head, his breath caught hard in his chest. “What the… Bloody…” he panted, heart racing, fear unlike anything he had ever known whining painfully in his brain, as he tried to make sense, any sense at all, of what he saw before him. Noel was standing atop the boulders that led to the lower tributary, leaned against the wall for support. His torch was lying there on the ground, just where he had tossed it, still alight with the dim glow of Hestia’s flame. His rucksack was spilled open on the boulders beneath him, as though he had tossed it away in his dread. He was quite alone. There was no sign of the woman, alive or dead, nor any evidence of the violent sands that had sprung forth from her corrupt remains, save for the few tiny grains that fell from his hair as he shuddered at the thought of her. He could not shake the feeling of her fingers gripping his hand in fear for her life, or the twitch of her limbs as she fought to breathe against the strength of his arms, crushing the life out of her, in order to save her.